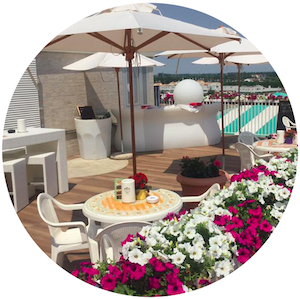 Terrazza Massimo is our luxury 6th floor roof terrace. Renovated in 2014, it provides the perfect place to relax and experience the Veneto sunshine in all it's glory. Terrazza Massimo features just 10 exclusive sunbeds, and you can upgrade to one for just €10 per sunbed, per day. In addition to the premium sunbed, you'll also receive a pool towel and two bottles of water to keep you hydrated throughout the day. Just visit the pool bar on the day for a ticket. Terrazza Massimo is the perfect place to relax under the Venetian sunshine and enjoy some traditional Italian cuisine. All guests can opt to dine on Terrazza Massimo throughout the day at no additional charge compared to sitting around the pool bar. If a sunbed isn't for you, we've got a number of large and luxurious sofa's that are available for guests to sit back and relax on. It's the perfect place to enjoy reading a good holiday book! These are available to all guests at no extra charge.